The idea of free trade is fundamental to the city and Corporation of Manchester. In 1812 the anti-corn law league set out to break the restrictive practices of the aristocratic land owners, and their hold over parliament to impose import duty on grain. The middle class merchants and manufacturers who advocated free trade understood that cheap food would mean cheap labour. The triumph of free trade enabled Manchester to become the largest import/export and distribution centre in England, and subsequently the British Empire. Between 1830 - 1870 cotton equated to a third of all Britain's exports, the majority of which moved through Manchester, hence the ‘Cottonopolis’ of Dickens caricature. Although Manchester was much more than cotton, with the expansion of the Royal Exchange, it became the second largest centre for commercial banking and joint stock trading, transforming itself from a manufacturer into a hub for global finance. With the advent of the Ship Canal in 1904, Manchester became Britain’s fourth largest port, even though it’s situated 38 miles from the sea. While the legacy of free trade dominates the social history of Manchester, traces of which are still evident in its architecture; The Free Trade Hall (1840), The Royal, Coal, Corn and Produce Exchanges, various magnificent wholesale warehouses, and beautiful 19thC Banks. Of course, the explosion of trade and extrusion of wealth began to find expression in a different kind of capital, 'cultural' capital. Resulting in the formation of the Royal Manchester Institution, the Athenaeum, and ultimately the collection of the Manchester Art Galley. A stunning example of the complex web of financial and cultural exchange in Manchester, and a perfect vehicle by which to trace their movements is the Beatson Blair Bequest. George Beatson Blair was one of three brothers -James, Alexander, and George- who were all partners in a cotton import/export and shipping company trading under the name of Barbour Brothers Exporting House, 73-75 Whitworth Street - more information in files lodged with the Local History Research Unit. They all lived as bachelors in their house in Whalley Grange, and like other wealthy middle class Manchester merchants, James and George turned their financial profits into cultural capital. They collected paintings, fine objects and bric-a-brac, financially supported the MAG as well as a range of other cultural institutions. James left 142 works (including 24 Turners) to the Gallery in 1917. On George’s death - MAG minutes record the bequest at the Committee meeting on the 16th January 1941- executors of the bequest estimate 30,000 objects, of which 5,000 were pictures. Considered as one of the most important collection to accrue to the MAG, it extended over the five entertaining rooms, twenty bedrooms, offices for staff, bathrooms, attics, halls, landings, staircases, workshops and the pig stys of Whalley House. Each room was overflowing, the result of sixty years of collecting during which time nothing was discarded. Mr Blair left no inventory, but framed and unframed paintings and drawings jostled with sculpture, western and oriental pottery and porcelain, glass, enamels, silver, pewter, bronzes and brass work, lacquer, jade and other hardstones, ivories, tortoiseshell, carved woodwork, silhouettes, textiles, embroideries and bygones. 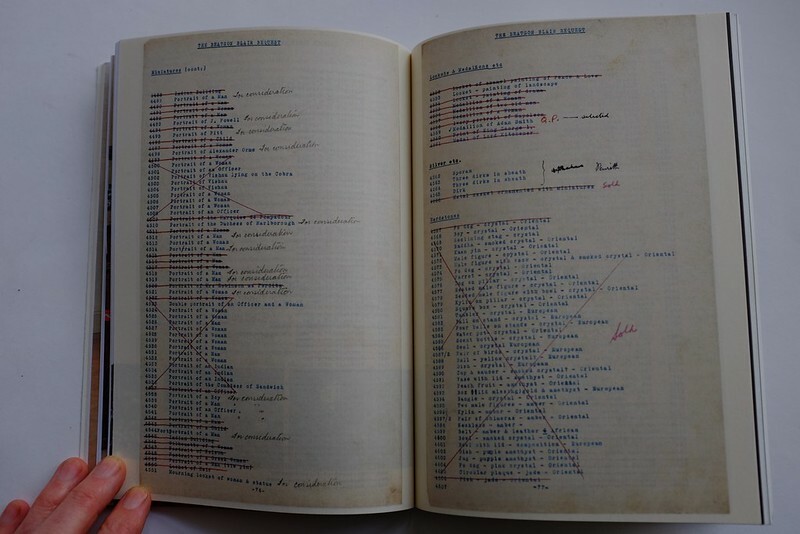 Of the thirty thousand objects mentioned by the executors - estimated 1941 value £57,700 - an inventory for 4894 objects exists in the MAG archive, and perhaps 384 were actually acquisitioned by the MAG - with an estimated 1941 value of £ 21,457. For the purpose of constructing one or more of the new rooms or galleries to be erected on the Athenaeum site in Manchester. Such rooms might be called the Blair Gallery and be used when practicable to exhibit the more important pieces of art or virtu that may be selected by the Corporation from my collection. If the above is sketch of a broad context, the following are the means by which we imagine the ideas will be made concrete. 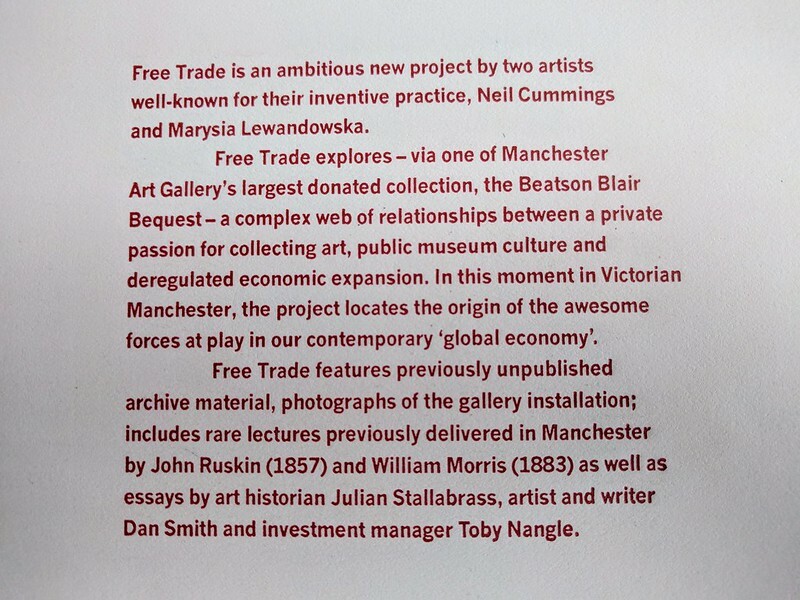 Our project FREE TRADE attempts to reconnect the Beatson Blair bequest with the circuits of exchange and trade from which it has - inevitably since entering the MAG collection - been isolated from. We imagine exhibiting the Bequest in its totality, our interest is not on the quality or specificity of an artifact - the domain of curators and experts - but in the quantity, diversity and taste of the whole. We intend to make the exhibition one strand of our project, embedded in a range of interpretive devices; archive films, recreated speeches, lectures, talks, tours, and publication. In Gallery Nine we would like to exhibit all the objects -not included elsewhere in the redisplay- from the Beatson Blair Bequest. Our intention is to emphasize the bulk and diversity of the collection, and to enable the characteristics of the bequest - eclectic, chaotic, domestic, middle class merchant taste - to become apparent to the visitor. This will be in sharp contrast with the collection divisions and display conventions in operation throughout the rest of the MAG. By comparing the various inventories, it’s interesting, given what is ‘missing’ - sold at auction - from the original collection how the Bequest has been made in the image of the MAG, and not of the Blair's themselves. All the glass and ceramic objects will be displayed/stored in the three or four ex-library display cases stored at Heaton Hall. The vitrines are as close as we can get to the display cases ordered by George BB - invoice and description in the archives - falling somewhere between the domestic and institutional. The cases could be modified to display metalwork - spoons, snuff and musical boxes, enamels - and bygones - rattles, truncheons, souvenirs, etc - in drawers and cupboards. We would like the display cases to be freestanding, possibly back to back, as a sculptural ‘presence’ in the room. As many of the paintings as possible - 32 provisionally selected- should be displayed - on the wall opposite the Royal Exchange painting - densely hung. Our intention is to mimic the display at the Whalley Grange House, and emphasise their status as objects. It’s also interesting to see en masse the Blair’s taste - and perhaps it represents a wider male, middle class longing - for pretty women, idyllic landscapes and saccharine children. All the things apparently missing from their live. Any painting to fragile to hang, could be exhibited wrapped in the library cases -as in the Queens Park store- or represented by empty cases, or traveling frames. The furniture from the Bequest should be displayed in an approximation of a domestic setting - tables, chairs, clocks, etc - and to ‘include’ the display cases, as objects of the collection. Packing cases and traveling boxes could hold/suggest objects from the Bequest to fragile to display. They would also imply that gallery objects are in transit, as if in motion from exhibition to store, and back again. To keep visitors from touching the furniture perhaps a carpet and/or hazzard tape barriers could protect the exhibition. We would like to price-ticket each object from the Bequest with the 1949 inventory estimated price. In an inversion of conventional gallery labeling, we would supply no object information except the one piece of information that visitors are often curious about “How much does it cost”. Our intention is to remind visitors that these objects were themselves - at one time - objects of trade, as well as the result of trade. We intend to turn the most complete inventory of the Bequest - 4894 objects - and the description of objects in the auctioneers catalogues - three tranches: 5 sales at Platt Hall, 9 sales at Whalley Grange House, and 5 sales at Christie's - into a complete digital record/archive. 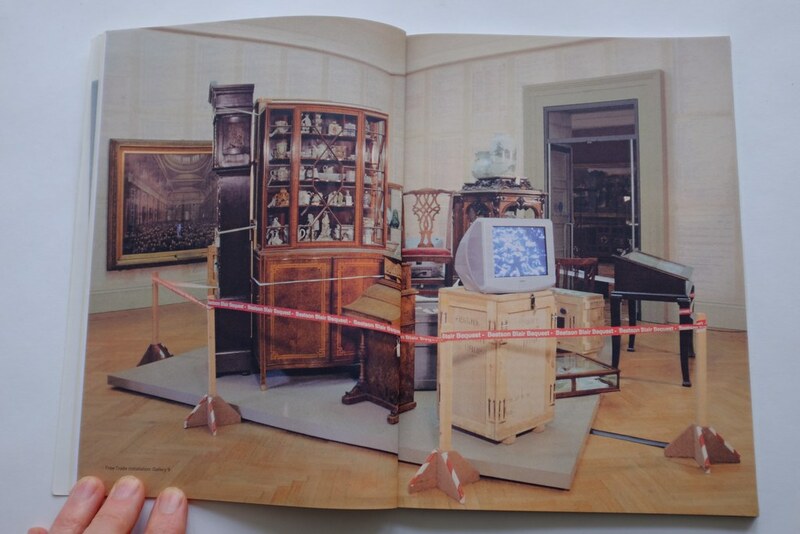 We would like to wallpaper the whole of Gallery 9 with the inventory, to represent what’s ‘missing’ between the collection at Whalley Grange House and the final MAG Bequest. We would like to find a way to link Free Trade to the 4/36ths of the estate mentioned in the Bequest, although we are unsure how to do this at the moment. We understand that this money, £15,731.10.9d in 1946 - now estimated at £300,000 is finally to be spent, funding part of the current redevelopment project? It seems like perfect timing. Using actors we recreated the opening address of the Royal Exchange from October 8th 1921. The Chairman of the Exchange Sir Arthur A. Haworth, and a reply by his Majesty George V, and printed in the Stock Exchange Gazette October 13th 1921. The audio track is triggered as you aproach a spectacular painting from Interior of the Royal Exchange and its Members (1879) - this painting has never before been exhibited. The speeches emphasize the importance of the Exchange to Manchester and the Empire. 1. 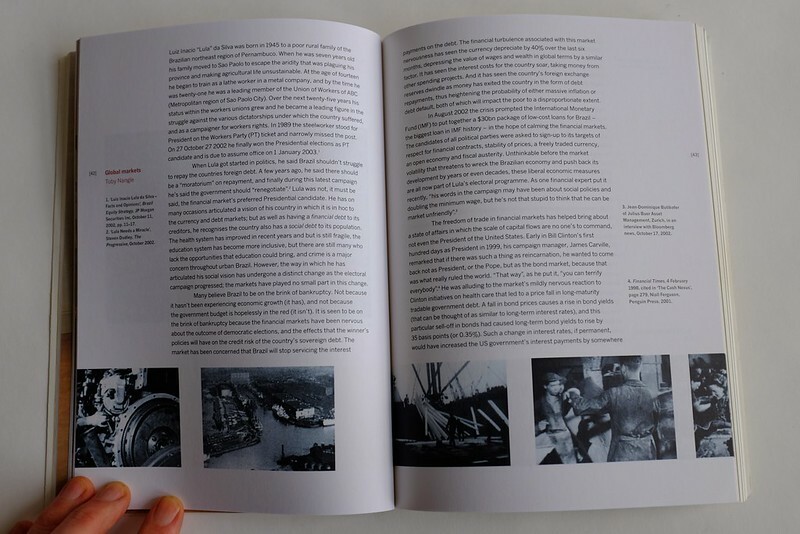 Extracts from A City Speaks, Manchester Corporation 1946, tracing the trajectories of raw materials, and the range of manufacturing and trade in Manchester. 2. Goods depicts the markets of Manchester including the Royal Exchange, the unloading and distribution of fruit, fish and meat, we see merchandise moving through the Ship Canal and the unloading of oranges, steel, tobacco, wood and grain. We celebrate the long tradition of the Royal Manchester Institute, the Athenaeum and the MAG in contributing to the introduction and interpretation of art to its public. In the same spirit we propose a series of formal lectures that mix contemporary scholars with historical lectures previously delivered at MAG. The lectures will be an integral part of the project, extending the themes of trade, exchange and the political economy of art, from the 1850’s to the present. A lecture by writer and critic William Morris - performed by Steve Whitehouse -, was first delivered at a joint conversazione of Manchester Societies at the Royal Institution, Manchester 6th March 1883. In this brilliant and provocative lecture, writer, craftsman and socialist William Morris challenges the merchants and manufacturers of Manchester. He suggests that free trade and the industrial reproduction of ugly and uneccesary things denies equality, freedom, and happiness for all. Consequently, contemporary art - produced under theses conditions- is nothing but the pretence of art. With uncanny prescience, Morris describes our current confusion; between art and fashion, or art and celebrity, or art and shopping. Academic and critic Julian Stallabrass will upgrade the themes of the William Morris lecture. As free trade is subsumed by vast exchanges of corporate capital, Julian explores the success and failure of contemporary art, amidst the commodified cultures of globalization. 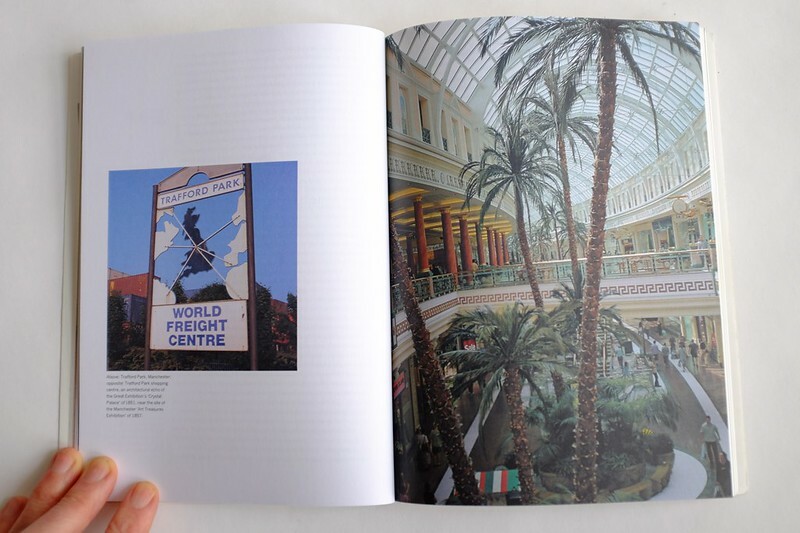 Julian’s recent book ‘High Art Lite’ punctured the pretension of the YBAs (Young British Art) brand. He teaches history of art at the Courtauld Institute of Art, University of London, the author of 'Gargantua: Manufactured Mass Culture' and co-editor of 'Occupational Hazard: Critical Writing on Recent British Art'. A lecture by writer and critic John Ruskin - performed by Paul O'Keefe - to coincide with the Art Treasures Exhibition was first delivered at the Manchester Athenaeum, July 10th 1857. John Ruskin’s extraordinary lecture attempts to build a political economy for art. He suggests that all economies require the wise management of labour, and could easily be divided into three components. 3. Distributing its produce seasonably. With devastating effects, this ideal economy is then laid over the production (artist), storage and distribution (museum/gallery) of the art of his time; a political economy for art that seems unchanged and still relevant today. Blue badge guided walks: A series of walks – lead by Steve Little, local architectural historian - around and through the Free Trade exhibition, the Gallery and then out into the city. The walks will visit the Free Trade Hall, The Royal, Coal, Corn and Produce Exchanges, the bridgewater canal, various magnificent wholesale warehouses –now home to internet startups, and a suite of beautiful 19th century Banks – now extravagant bars. We also edited a souvenir publication, with previously unpublished archive material alongside photographs of the gallery installation; featuring texts of the lectures by John Ruskin (1857) and William Morris (1883) and commissioned essays by historian Julian Stallabrass, artist and writer Dan Smith and investment manager Toby Nangle. 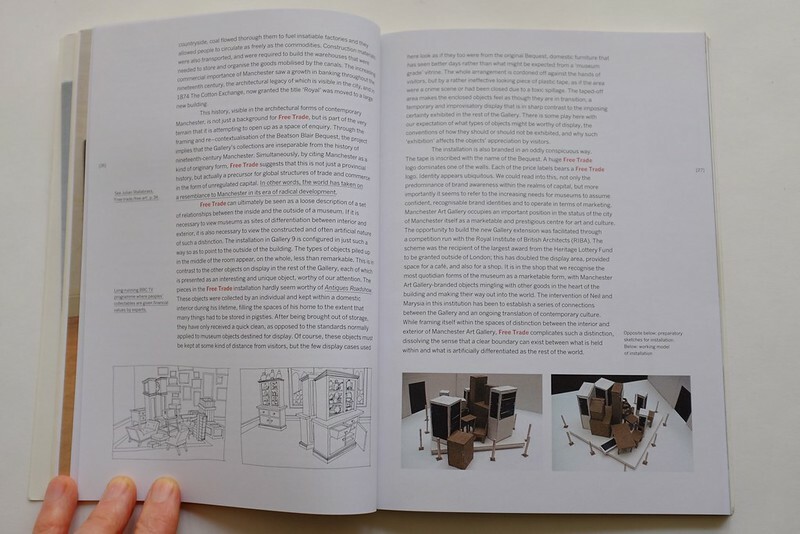 There is a beautiful publication is designed by Anne Odling-Smee, here are some images. Related projects include A joy Forever, Collected and Temporarily Removed.